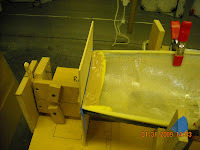 The hull from the mold is a bit short in the transom, requiring the transom to be built up to make contact with the deck piece when joined together. We used some modeling clay an laid it up in the hull and formed it to fit to the deck piece. This was used as a form and epoxy thickened with micro balloons was poured into the void. This will be sanded down to match the deck piece and will allow a good surface area for the hull and deck to be joined.